Grays and Torreys has been on my winter 14er list for a long time, but seems like every time I check the forecast, the winds are brutal! I think there’s no such thing as a bluebird day on the divide in winter. I watched the forecast throughout the week and as expected, it got worse. Why is that? Maybe NOAA wants to get our hopes up and boom, they’re shattered! The forecast ultimately said high of 20, sustained winds 25-35, gusts to 50. I figure I can do battle with 50 mph gusts since a lot of the hike should be protected. Back on Jan 5 I attempted this hike with a few folks in less than ideal conditions. We turned tail at about 12K as the banshees (clever term from Ken Nolan for spindrift) were out in full force with light snow and limited visibility. As we drove up I-70 that morning, a sign indicated a high wind advisory. That same sign was blinking as I drove up for round two. Could it be dejavu? I set out at 6:25am under clear skies and a 15 degree temp. Last time, we were able to drive a little past the first switchback, but the road is not even passable from the bottom now. I chatted with a landowner on the way down and he said this is the most snow they have seen in Feb in awhile. The good thing is there’s usually always a well trodden track to the summer trailhead, and I’m up there in decent time. The wind is hardly noticeable at the trailhead, but it sure is up high! I set out from the bridge and I’m in luck as a lone ski track is available. How long will this free lunch last? Unfortunately the track follows the trail uphill at 11800’ when it zigs towards the loaded east slopes of Kelso. I take a more conservative line and leave the trail, giving a wide berth should an avy cut loose. The winds blow through this valley with such ferocity that the snow is either blown to China or it turns into sculpted, supportive, sastrugi. I’m more than pleased as the willow monster shows mercy on me and closes his trap doors. I usually do a pretty good job of not forgetting any critical gear, but today I somehow left not only my down vest (luxury item), but also my hard shell! Luckily, I always pack my huge down coat, so it will have to do when the winds get tough. As I ascend the valley, short waves of spindrift blast through, but my soft shell keeps me warm enough. As I rejoin the trail at the nose of the northeast ridge, a wind shadow from Kelso Ridge is enjoyed. I leave my snowshoes on as they come in handy on the little sidehilling section. The views of Torreys are worth the price of admission to say the least. The trail is pretty easy to follow, but I decide to leave it and take advantage of firm, low angle snowfields on my snowshoes. I cache them at a huge cairn and don my goggles and down coat as it is apparent that the free lunch has expired. Time to visit the dues collector! I guess these winter summits have to be earned. The only other time I’ve hiked in my down coat was on Kili, so the key will be to hike slow enough not to overheat! I’m actually on a closed section of trail and end up contouring up and left, trying to keep the wind at my back. I regain the main trail and the final switchbacks are brutal. Sometimes I wait to take a step for a brief lull in the wind. I top out at 11:40 and am happy that the rock shelter makes things quite pleasant up there. I shot a short video at the top. 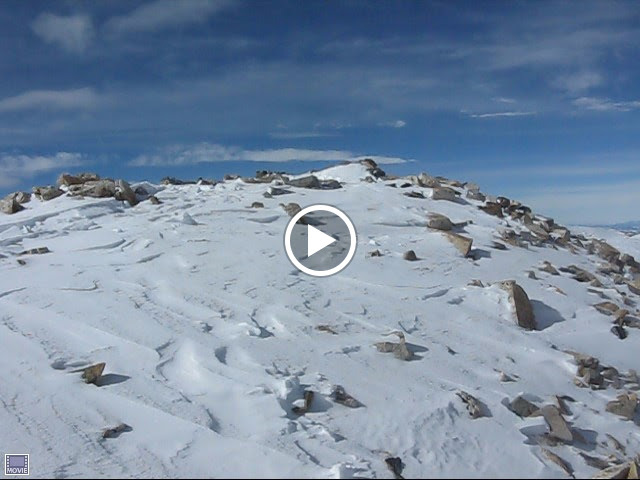 The winds were actually much worse on the descent to the Torreys saddle. I sign the register, down some Gatorade, and prep for the worst part of the day. I’m actually the first to sign the register this year, but there are recent tracks. I feel like I’ve stepped out of the eye of a hurricane as I descend to the saddle. I try to stay off the crest of the ridge and try to let gravity assist with the battle with the banshees. The funnel effect takes hold as I approach the saddle, so I drop slightly below it on the south side. The wind is not strong enough to knock me down, but it blows me sideways and puts pressure on my goggles! My trekking poles get blown horizontal when I let them flail from my hands. I was hoping that Torreys would provide a bit of a wind shadow, and luckily it did. The ascent was not as bad as expected. The snow was very firm in spots, so I decided to put on my newly purchased microspikes for the descent. The summit was actually quite pleasant, and I refueled for one final battle. There was a long snowfield just below the saddle that the trail crosses that obviously was going to be a no go. The safest option was to reclimb Grays to a point where crossing the snow high enough where it was very shallow, which ended up being at about 14K. I then dropped down to retrieve my snowshoes and it was smooth sailing from there. The wind had obviously kicked up in the valley as the spindrift was swirling around more, but it was more at my back. My tracks from the morning had been obliterated, and there was actually some trail breaking to be done back to the summer trailhead. The slog down the road went pretty quick and I was back at the car at 4:40, just in time for the crux of the day, dealing with nasty ski traffic!